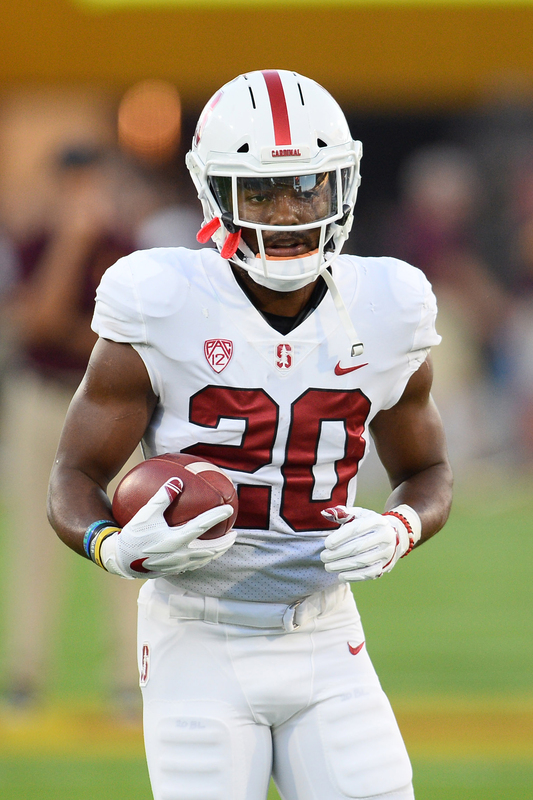 Though it was not reported at the time, Stanford running back and NFL draft hopeful Bryce Love tore his ACL during his final regular season game, Yahoo Sports’ Pete Thamel writes. Thamel reports the star back underwent surgery to repair the injury on Dec. 18 with Dr. James Andrews and is expected to make a full recovery. He will be at the NFL Draft Combine in February, but will obviously be extremely limited. He is also too early in the rehab process to have a return date set. Love burst on the scene as a junior, taking over for the departed Christian McCaffrey in Stanford’s backfield and rushing for 2,118 yards and 19 touchdowns in 2017. The breakout season helped him finish second in the Heisman Trophy balloting, behind only Baker Mayfield. His senior campaign was not as impressive, however, as Love logged just 739 yards on 166 carries in 10 games. According to WalterFootball.com, Love is tabbed as the No. 5 running back prospect in the upcoming draft, with a projected draft spot coming in Round 2 or 3. That is likely to take a plunge following the news of the serious knee injury. Bowl games outside the playoff are going to end up like all star games. All the quality players sit out to avoid injury. Long overdue. Why on earth anyone cares about bowl games, I’ll never know. They’re irrelevant, throw away games that should have been buried years ago. Bowl games were for the alumni to take winter vacations to sunshine locations. Outside of the championship game nobody cares about them. @Cam @Polish Hammer Spoken like guys who never played the game above (maybe) the Pee Wee level. All college teams care about getting to bowls and winning them. Successful programs win bowl games and no player worth his salt would want to go to a program that didn’t. If you’re someone who would sit out such an important game for your team then you don’t deserve to be part of one. Wasn’t a bowl game.. should these guys just like not play football and just be drafted based on speculation? Yes, it was not a bowl game. So now are college players going to want to start sitting out the final game of the season now also? I would not even draft a guy that sat out their bowl game. Bowl games aren’t meaningless to the teams that play in them. Why would you want to play for a program that doesn’t go to and win bowl games? Because there is a hundred bowl games. Almost all have little or no meaning unless you are from some no name college or a bettor.